We’d love your help. 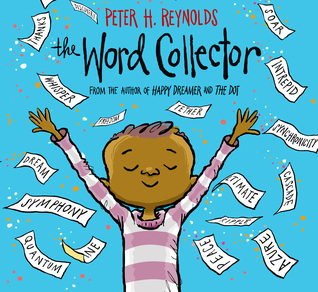 Let us know what’s wrong with this preview of The Word Collector by Peter H. Reynolds. Fro Some people collect stamps. To ask other readers questions about The Word Collector, please sign up. What age level for this book? Joy I'm not an early childhood expert, but I would say ~5-7 years old (K-1). Words tend to either erect or obliterate boundaries between human beings. Thankfully, this is a book about forming bonds in the most unusual way. Whereas most of Jerome's peers collect video games, cards, devices, etc., his goal is to collect as many words as he can. The acts of reading and searching for meaning become essential for his growth and well-being because he wants them to be like that. He found joy in what others usually perceive as being frivolous, and it genuin Words tend to either erect or obliterate boundaries between human beings. Thankfully, this is a book about forming bonds in the most unusual way. Whereas most of Jerome's peers collect video games, cards, devices, etc., his goal is to collect as many words as he can. The acts of reading and searching for meaning become essential for his growth and well-being because he wants them to be like that. He found joy in what others usually perceive as being frivolous, and it genuinely makes him happy. Perhaps the key moment of his journey is when he slips and the words "become jumbled". He doesn't cry over them, nor does he give up; he simply strings them together and uses them to recreate the sources which he drew the words from in the first place, as well as create something new out of them. He also finds the simplest words to be incredibly effective in uniting people. The book itself gains the reader's attention using simplistic illustrations, colorful pages... and words. Lots and lots of words. You never know which one will help you make it through the day. I really loved the beginning of this book - and even the middle! (Get this kid a magnetic poetry set, stat!) I love that he started stringing words together and making poetry and songs. But then... it got a little....preachy? It became much less a story about a "real" boy who liked to learn new words and more about an allegorical boy who changed the world, one word at a time. Which... if it had *started* like that, it wouldn't have annoyed me at all. But as written, it was a little jarring. Each year my family reads all the Goodreads-award-nominated picture books, and we have been doing this for years. Everyone rates each book and adds a comment and it may (or may not) affect my overall rating. This is book #8 (of 20) of 2018, and yet another example of my separation from my own family on some of these books. This is the first year this is happening, dunno why. In spite of my low, (mean) personal review, I upped the rating to reflect the family reading. Tara: 5 stars. I love this! L Each year my family reads all the Goodreads-award-nominated picture books, and we have been doing this for years. Everyone rates each book and adds a comment and it may (or may not) affect my overall rating. This is book #8 (of 20) of 2018, and yet another example of my separation from my own family on some of these books. This is the first year this is happening, dunno why. In spite of my low, (mean) personal review, I upped the rating to reflect the family reading. Tara: 5 stars. I love this! Learning to express himself and make the world better. Harry (13): 4 stars. I like how he helps the world by sharing his words and thoughts. Hank (12): 5 stars. Amazing! Lyra (11): 4 stars. I like how he collects words, then gives them away, then finds new ones. Jenn (family friend): 4 stars. Jerome is my kind of boy. I especially love the jumbled word pages such as "Blue Harmony," "Silent Orchestra," and "Whisper Symphony." This was a sweet sweet book about words, and about Jerome who collects words. Words are little gems, and collects and organizes them. And then he fell and all of his words went flying. He starts stringing them together and playing with them with less order. In the end he sends them to the wind. And other kids are starting to play with them. One of the best books that I know is The Phantom Tollbooth by Norton Juster. It is so much better than any other elementary school age (and above). It is play This was a sweet sweet book about words, and about Jerome who collects words. One of the best books that I know is The Phantom Tollbooth by Norton Juster. It is so much better than any other elementary school age (and above). It is playing with words, numbers, concepts and more. This book was a tiny reminder of that (just tiny though). The story here, is not as tied together, and just touches a bit about the beauty and power of words. 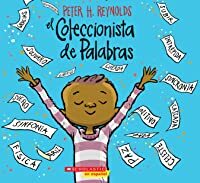 In this picture book, Peter H. Reynolds does for words and literacy exactly what he's accomplished with his previous titles on art, he makes them cool and wraps them in a clever, philosophical package. Jerome collects words, and he even organizes them into categories. But an accident leads to the realization that sometimes words that seem to have no relationship to each other actually gain new meaning when placed by different, unrelated words. 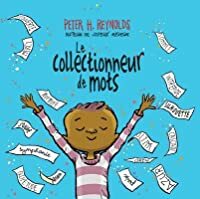 Not only does he start to realize the power of words In this picture book, Peter H. Reynolds does for words and literacy exactly what he's accomplished with his previous titles on art, he makes them cool and wraps them in a clever, philosophical package. I'm calling this book poetry because it speaks to my soul in that way. The main story is about a boy who collects words. It's how the words are kept, expressed, and strung together that matter. I was enraptured by reading the words scattered on the page, and I Loved how the pairings sang. I want to collect words too, and see what happens when you throw them down together in a happy jumble. This is such I'm calling this book poetry because it speaks to my soul in that way. Really disappointing. I read this aloud (to my 15 year old daughter) and partway through I started adding snarky asides about how this kid is really annoying and LITTERING - stop throwing your little bits of paper all over, Jerome! That's LITTER! Stop it! Also, poetry and music is more than just random words strung together; I thought it was weird to imply that you will naturally become a beloved poet and musician just because you collect words. The importance and beauty of words and how putting some together can be powerful and poetic! The power of words! Cute story to show the importance words hold. I can't really recommend this book to anyone because of the ending. While the beginning would rate a 4, the end was a huge mistake that I am sorry other readers have ignored. Really littering is okay to teach children? Really Peter H. Reynolds couldn't think of an alternate ending? Peter H. Reynolds creates a character, Jerome, who has a special interest in collecting words. In "The Word Collector," Jerome is constantly picking up words to add to his collection. This story is in the fantasy genre and would be best suited for grades kindergarten through third. Within this story there are many exciting words, some that would be familiar to the reader and some that are brand new. Throughout the story, Jerome shows the reader all the many places one can collect words. Just by Peter H. Reynolds creates a character, Jerome, who has a special interest in collecting words. In "The Word Collector," Jerome is constantly picking up words to add to his collection. This story is in the fantasy genre and would be best suited for grades kindergarten through third. Within this story there are many exciting words, some that would be familiar to the reader and some that are brand new. Throughout the story, Jerome shows the reader all the many places one can collect words. Just by listening and looking there are words all around us that can be stored in our minds. Words don't have to be in a specific category they can be used together to create something wonderful! Jerome shows the reader this during the story. The illustrations are vibrant and really grab the readers attention. I used this story as a read aloud with my tutoring buddy, and I just watched as she was intrigued by ever word displayed on the page. "The Word Collector" excites the reader about learning new words, especially words they have never seen before. I feel like Reynolds does an excellent job of having a wide range syllable words displayed on the page. An activity that I would like to do with this story is to have my students take out their notebook and their job is to collect words that they see or hear throughout the day. I would give them a certain amount of time each day and we would do this for a week. I think that on the last day students will be shocked to see how many words that they have collected. The words can't just be any words, but words that stick out to them. Then students can use this collection as reference for their writing in the future. Another way that this story could be used in the classroom is for instructional purposes. This would be a great story for a read aloud. It introduces students to new and higher vocabulary words. As we have learned in class this is very important for readers. In addition, I would have students write a fantasy of their own. Students would be the collector and they would choose what item they would want to collect. Throughout the story they would need to incorporate new vocabulary that is associated with this item. They would have to discuss where they would be able to collect this particular item. Since this is in the fantasy genre students can really use their imagination which I feel will create a bigger opportunity for creative words. Words are a wonderful thing. Without them we wouldn’t have self-expression, identify our favorite foods or even say hello to a friend. But, can words be collected like stamps, coins or even art? Of course, they can according to Jerome. Whenever Jerome here’s a word that sounds interesting, he would write it down on a piece of paper. Jerome was a word collector and he loved it. He liked the word Willow from a poster at a tea shoppe. He wrote down Emerald after reading The Wizard of Oz. He thought Words are a wonderful thing. Without them we wouldn’t have self-expression, identify our favorite foods or even say hello to a friend. But, can words be collected like stamps, coins or even art? Of course, they can according to Jerome. Whenever Jerome here’s a word that sounds interesting, he would write it down on a piece of paper. Jerome was a word collector and he loved it. He liked the word Willow from a poster at a tea shoppe. He wrote down Emerald after reading The Wizard of Oz. He thought that multi-syllable words like guacamole, geometry and kaleidoscope sounded like songs. One day he slipped and fell, and his words became a little mixed up and he noticed he could put them together to make wonderful combinations. Jerome realized that words were powerful. With so many bags filled with all of his favorite words, Jerome released them into the wind. What do you think happened after that? 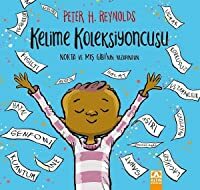 Best selling author Peter H. Reynolds has created a quick and easy read filled with wonderful words beginner readers will love learning. Colorful illustrations depict his favorite words and the power that they hold. Young readers will have fun pronouncing and seeing what each word represents. Parents, teachers and caregivers can discuss what words children like the most. 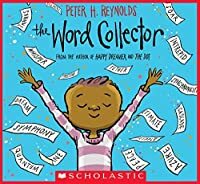 The Word Collector written and illustrated by Peter H. Reynolds. The text and word pictures were designed by the author. Jerome, the main character, is a collector of words. He has created books and books of word cards. These books are arranged in categories. One day, he slips, and the words cards go flying. From the jumble, Jerome realizes he can mix words to make poem and songs that will make other people happy. The words in this book are interesting and many are even challenging. 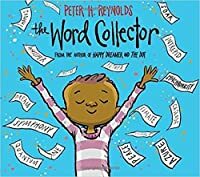 Students can The Word Collector written and illustrated by Peter H. Reynolds. The text and word pictures were designed by the author. From the jumble, Jerome realizes he can mix words to make poem and songs that will make other people happy. The words in this book are interesting and many are even challenging. Students can take groups of words to jump-start their own stories, poems, and songs! A beautiful story about the power of words. The illustrations are so wonderful and so welcome to see the main character as someone who is brown and is valued in the story (it is so sad how infrequent this is). I love this story, the words, the bright colorful clothes the characters wear, and the engaging imagery the illustrations tell. I also love the last page of the book and the question it poses to the reader. This is a joyful story about words and the boy, Jerome, who collects them and, ultimately shares them. At first, he keeps his words organized. One day, he slips and his notebooks of organized words go flying and become "jumbled." And this is not the end of Jerome's story. I loved this book! We got it from the library but I'll be buying a copy to keep on my daughter's bookshelf. Peter H. Reynolds is just great and this book is all about the joys of language. It was the perfect title to read during Poetry Month. 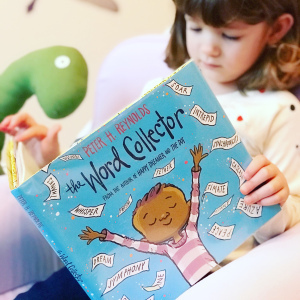 I love Peter Reynolds' picture books, and as a "word nerd," the story of a boy who collects words that he likes the sound of, or that "jump off the page," really resonates with me. My fave of his so far. A book that gives you the warm and fuzzies particularly when you are a word collector yourself. Who doesn’t love words and their meanings and sounds and significance? Jerome is such a boy and when he collects, they get jumbled up in a fall, but then he realizes there is nothing better than releasing them for everyone else to enjoy. It’s heartwarming and illustrated with an appreciation for words and the character. Plus the colors are to die for. I’m certainly adding a few to my HS collection. This book was a great teaching tool for my middle school students! So far this has been our least favourite of the Goodreads Choice Awards nominees. It isn’t that it’s not good, because it’s quite interesting as ideas go, that collecting ewords would lead to poetry and then sharing the words with others. But the other books have been so good and this is only good. The diversity of the children is excellent and the variety of words Jerome collects is fun. Reynolds just makes lovely feel good stories. This one centres on Jerome, he collects words, all sorts. I enjoy that the words are not all simple, how else can you learn new ones? Poems, stories and songs are as varied and have power. Saint Jerome is the patron of librarians and encyclopedists. The book touched me deeply. Same premise as Max's Words by Kate Banks but with more charming artwork and a story that focuses more on poetry and the power of words, not necessarily the creation of stories. While it’s not about poetry, it’s such a gem to open a poetry unit talking about the power of words. Peter H Reynolds has another marvelous hit on his hands. Peter Hamilton Reynolds is an author and illustrator of children's books and is the co-Founder and CEO of educational media company FableVision.